There’s no gas in Bodie, road-trippers, despite the gas pumps. This is also high season for the all-American road trip. And there’s one supremely scenic road you need to visit—or revisit—this summer, even if your only trip is a quickie to Southern California, to check in with family and friends. Skip the mind-numbing thrum of I-5 and go the back way instead—US Route 395, sometimes still known as the Three Flags Highway. Those “three flags” would be Canada, the US, and Mexico, because the original route ran from San Diego near the Mexican border to British Columbia, taking in big-sky stretches of California, Nevada, Oregon, and Washington along the way. In place and heavily promoted by business interests in California before WWII, Route 395 never achieved the fame of cross-country Route 66. Which will surely seem inexplicable once you too are struck dumb by the drama of the Sierra Nevada’s eastern face. Such bold beauty. The quintessential “California” stretch of 395 rolls south past the lonely towns of Topaz, Coleville, and Walker to Sonora Junction, then on into Bridgeport, county seat (population just over 500), once aptly known as Big Meadows. Next major attraction on this vast, open plateau is what remains—in a carefully managed state of “arrested decay”—of the big, bad mining town of Bodie, now a bona fide ghost town and very remote state historic park. What does it say about this place that its own boosters boasted that Bodie had the widest streets, wickedest men, and worst climate and whiskey in the West? To find out, spend at least a half-day strolling these lonely, weatherbeaten streets and cemeteries. Next south is Mono Lake and vicinity and, just beyond the town of Lee Vining, the steep back-door climb into Yosemite National Park. Mark Twain called Mono Lake, then commonly known as the Dead Sea of California, "one of the strangest freaks of Nature found in any land." The lake's water was so alkaline, Twain quipped, that "the most hopelessly soiled garment" could be cleaned simply by dipping it in the lake then wringing it out. He also noted the peculiarity of a sky full of seagulls so far from the sea, and the region's predictable two seasons: "the breaking up of one winter and the beginning of the next." What Twain couldn’t know as we fast-forward more than 150 years into modern times, is that Mono Lake today would be considered the victor in one of the hardest-fought environmental wars of the century—one that pitted L.A. water consumers, represented by the city’s Metropolitan Water District (the bad guys in the movie Chinatown) against lovers of the land and landowners in the eastern Sierra Nevada. That drama continues on other fronts, as Northern Californians know full well, but the morality play was—and still is—easier to see in the Mono Lake Basin. 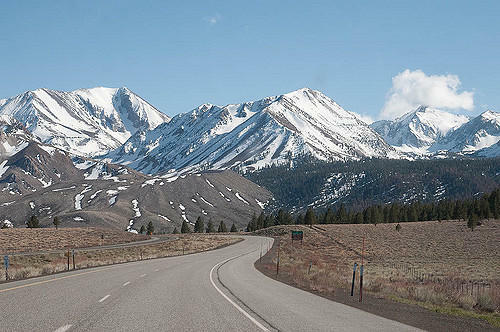 Along this stretch of Route 395 are curly whiskers of road that reach up into the rugged mug of the eastern Sierra Nevada to granite lakes, piney cabins, and old-timey summer resorts and campground. The June Lakes Loop is just one such side trip, in the sawtoothed-shadow of the Ansel Adams Wilderness, starting about five miles south of Lee Vining. Winter skiing is a big deal here and just south at bustling Mammoth Lakes, which offers urban amenities, more mountains lakes, and cool conifers as contrast to the highway’s sagebrush scrub. 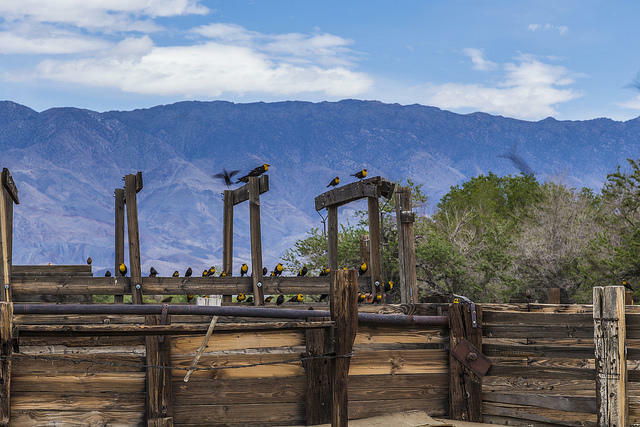 Next south is Bishop, famous for its Mule Days Celebration every Memorial Day weekend, and then Big Pine and Independence, the lonely landscape between them all famous for blinding dust devils that rise up from long-dead Owens Lake. Head east from Independence to reach the Ancient Bristlecone Pine Forest, where these scruffy ancients have been alive longer than anything else on earth, some trees for more than 4,000 years. Stop at the Eastern Sierra Museum and the Mary Austin Home in Independence, and visit the striking 1917 Tudor-style Mt. Whitney Fish Hatchery just north. South of Independence is what remains of the WWII-era Manzanar Relocation Center for 10,000 “interned” Japanese Americans. Then there’s Lone Pine and Mount Whitney looming above, highest peak in the 48 contiguous US states, an immensely popular 10-mile hike—so popular that permits are required—from May or June into October, when the trail is passable. From here you can also hike the Sierra Nevada to Sequoia-Kings Canyon National Parks. Or get back into your car and drive the fairly short distance southeast to Death Valley National Park—the lowest point in the Lower 48. Before you go tour Lone Pine’s dirt-road Alabama Hills. You may swear you’ve been here before—and you have, at least vicariously, because so many western movies were filmed here—High Sierra, Red River, Bad Day at Black Rock, and They Died with their Boots On, to name a few—and non-westerns, such as Star Trek V. not to mention TV westerns such as Bonanza and Have Gun—Will Travel. Today we head Up the Road to the heart of the State of Jefferson and its once (and possibly future) capital, Yreka. There’s something profoundly different about a place proud to be in a constant state of rebellion. In the bigger picture that place would be California, which has considered more than 200 different independence proposals since statehood in 1850. Some of the first serious attempts to break away came from thoroughly dissed Los Angeles, still a dusty cowtown when the streets of San Francisco were almost literally paved with gold, after the gold rush. Today we head up the road to visit Charlie Brown, Snoopy, Woodstock, and all the rest of the Peanuts gang at Santa Rosa’s contemporary Charles M. Schulz Museum. This impressive collection commemorates the life and work of cartoonist Charles Monroe “Sparky” Schulz, a longtime, low-key Santa Rosa resident until his death in 2000. Despite his quiet, very local life, Schulz was internationally celebrated—more widely syndicated than any other cartoonist, and the only newspaper comic artist ever honored with a retrospective show at the Louvre in Paris. Today we head up the road to the North Coast college town of Arcata and its annual celebration of both Kumamoto and Pacific oysters, mainstays of Humboldt Bay’s immensely successful aquaculture industry. It’s good to talk up top-notch local products. And it’s great to be able to boast about local water quality, which growing robust oysters implies. Oysters thrive—and can safely be farmed for human consumption—only in clean, healthy, protected waters. In California that means the northern reaches of Humboldt Bay, also known as Arcata Bay. Much of the south bay is unavailable for aquaculture, protected as the Humboldt Bay National Wildlife Preserve, home to hundreds of local and migrant bird species and other wildlife—a destination also well worth your time.